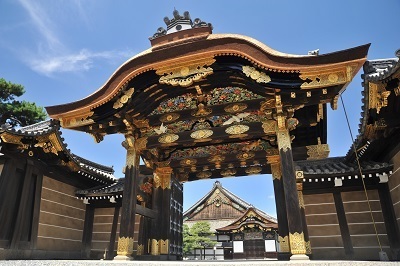 N-sama and O-sama got married at Nijo Castle which is listed as the world heritage, today. The wedding ceremony at Nijo Castle was non-religious and performed in front of the important people for the couple. 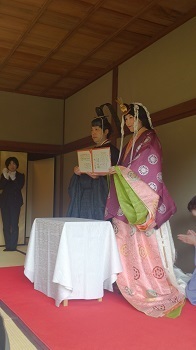 The bride and groom wore the Japanese traditional costume; “sokutai” and “juni-hitoe” respectively. 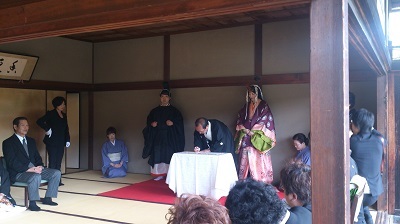 And the Mayor of Kyoto city, Mr. Daisaku Kadokawa, made a witness of their marriage and signed the marriage paper. The “juni-hitoe” was specially prepared with consideration of the safety for the mother-to-be bride, as wearing “juni-hitoe” at the wedding ceremony was her strong desire. I wish them and both families happiness for many years to come.